Dora Linda Nishihara was driving in San Antonio one dark evening in early December when she suddenly disappeared from sight. 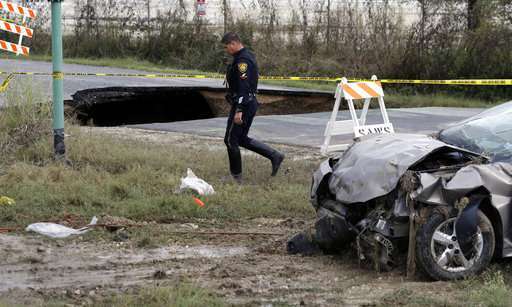 Later, her car, with her body inside, was found at the bottom of a 12-foot-deep water-filled sinkhole that had swallowed the road ahead of her. Two days later, a school bus driver in Brooklyn, New York, ran into a huge crater on his route. Luckily, no children were on board and the driver survived with minor injuries. Just last week, massive holes opened up in New York City's lower Manhattan, suburban Atlanta and San Francisco. Sinkholes are not a new phenomenon in the United States, especially in a half dozen states where the geology makes them more likely. But a recent spate of huge, sudden-appearing caverns is prompting alarm because they're happening in places where they shouldn't, and now seem to be proliferating nationwide. The usual cause: crumbling water, drain and sewer pipes, often neglected by cities with budget problems. Some experts are calling now for a national study to assess the risk and potential remedies, which could involve high costs for many jurisdictions. "The financial impact on cities is in the millions of dollars a year around the country," said Bob Brinkmann, a professor of geology, environment and sustainability at Hofstra University. 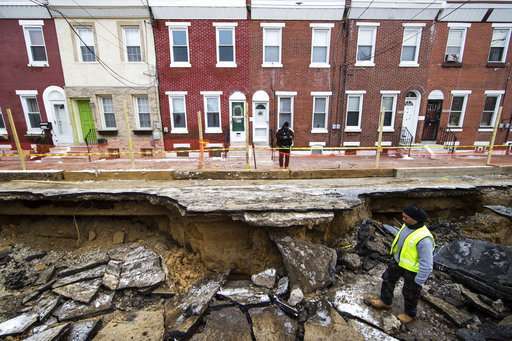 No government agency keeps track of sinkholes from man-made causes. Most of the scientific research has focused on areas where limestone, caves and natural springs create prime conditions for earthen collapses. Florida has the most. 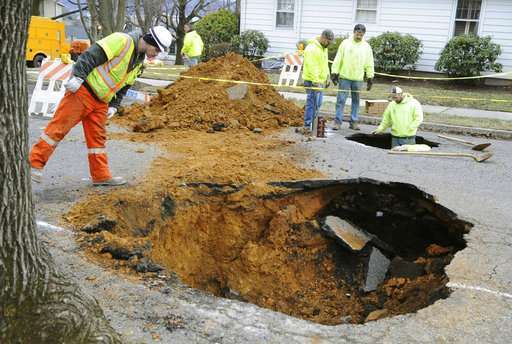 But scientists who study natural sinkholes say the caverns from infrastructure failures are becoming a bigger problem. From early December through April, according to a review by The Associated Press of media coverage, 39 significant sinkholes related to failing infrastructure—a rate of about one every four days—struck across the country in places as varied as Chicago, Los Angeles, Hoboken, New Jersey, Sioux City, Iowa, and Seattle. One person was killed and four were injured in the incidents, which also prompted extensive evacuations and disruption of utilities. On Christmas Eve, a hole the size of a football field suddenly swallowed parts of three houses and a section of road in a Detroit suburb. 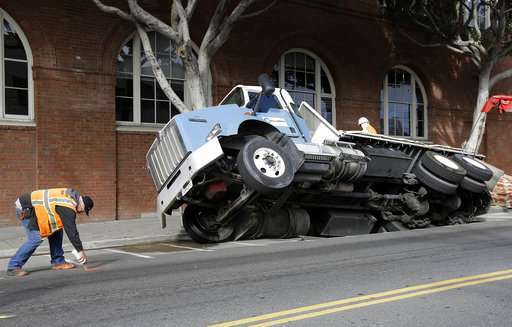 The sudden crater in San Francisco last week, 20 feet long (6 meters), pulled in a semi-truck. The cause of that one has not been determined. The sinkhole that killed Nishihara, 68, in San Antonio was caused by a sewer line that ruptured during heavy rains. The break happened where a 50-year-old pipe scheduled for replacement joined a newer pipe. The city has been under a federal consent decree since 2013 to replace its aging sewer lines. In a report last year, the American Society of Civil Engineers said that public spending is running far short of what's needed to replace water and wastewater systems that will be outmoded by 2025. The funding gap was estimated at $105 billion now, up from $55 billion in 2010. "We're way underfunded on these systems," said Greg DiLoreto, who heads the group's infrastructure committee. "That's causing more and more of these pipe systems to fail. In Washington, D.C., for example, they're using pipes that were installed during the Civil War." Most water lines in the U.S. are at least 50 years old and many mains in urban areas date to the early 1900s, according to American Water Works Association, which warned recently that "the replacement era" had arrived. Obsolete cast iron and asbestos cement lines are now replaced with more durable ductile iron or plastic. Maintaining current service would require at least $1 trillion over the next 25 years. 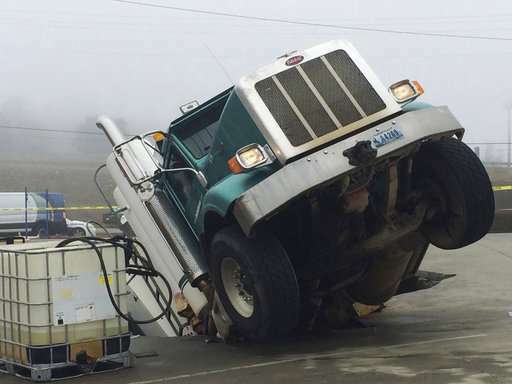 Similar upgrades are needed for old concrete or clay tile sewer lines, DiLoreto said. In the Detroit suburb of Fraser, no total damage estimate has yet been compiled for the huge sinkhole that suddenly routed 22 families after a 44-year-old sewer line collapsed at 6 a.m. on Christmas Eve. 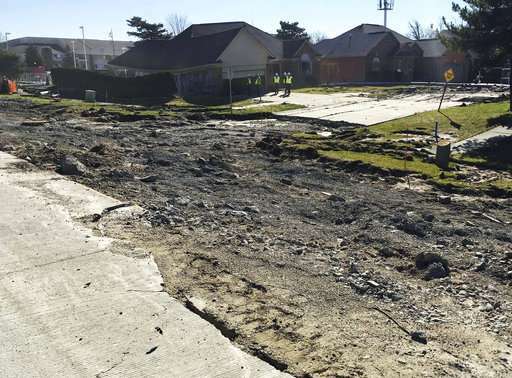 The cost of replacing the road and sewer line alone could exceed $70 million, and Macomb County has set aside $1 million for the three houses lost. Officials are beginning a study of its entire pipeline system that serves 500,000 residents in 11 communities, said Macomb County Public Works chief Candice Miller. It can't wait any longer, Miller said. "We're going to manage our assets and the first way to do that you need to know what their condition is." Leaking pipes are a major cause of sinkholes, but few, if any, reports acknowledge the role of acid rain and acid run-off dissolving limestone over time.